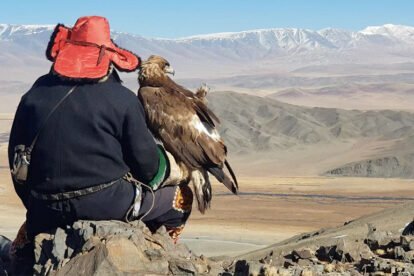 Sometimes, when recalling the places I have visited on my trips, I strive to pick an adjective or a metaphor that, in my opinion, could describe each one of them in the best possible way. A pastime and nothing else, that nevertheless helps me put together all the bits and pieces of my experiences and bring back memories that had been long dormant, connecting all of them with a fil rouge. In a few cases my attempts were fairly unsatisfactory, but when my eye finally spotted Oslo on the list, ‘fresh’ was the first word to come to mind. No hesitation, no need to think further. 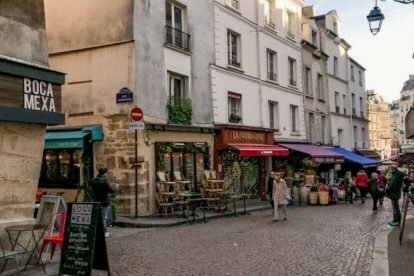 To me, the city I visited only once and did not stay long at, is ‘fresh’; and indeed I could see that emerging again, while drawing up the following city itinerary and picking our locals’ suggestions. 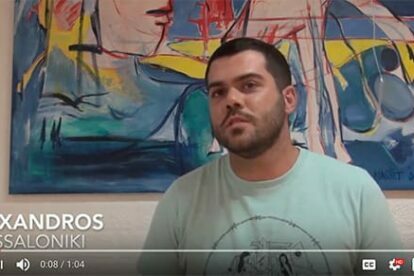 Can my perception be attributed to the history and development of the Norwegian capital? Oslo was established as a city a little less than a thousand years ago. In European terms this is fairly recent. 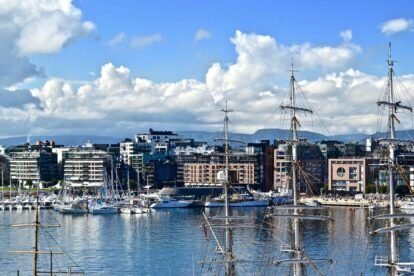 If we also consider that, upon being ravaged by fires on a number of occasions, in 1624 Oslo was moved from its original location to a plot of land that is now its historical core, the city definitely is young . 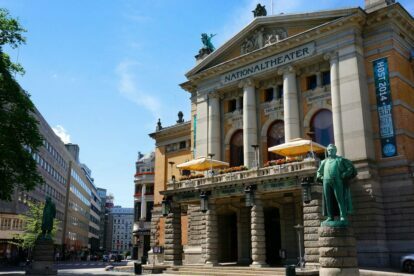 Except for a few century-old examples, the cityscape is fairly modern – with most of Oslo’s old flair dating back to the 19th century, when Neoclassical architecture was all the state. 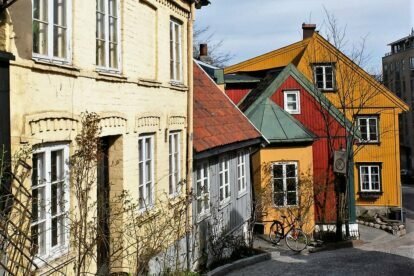 Its current name is kind of fresh, too: following its re-founding the new settlement was renamed Christiania (then Kristiania), and its original name was officially restored only in 1925. I landed in Oslo in June, when the temperature was still chilly for a Southerner like me. While sailing on a boat to shore, your sight is caught by the many islands dotting the fjord, and the trees crawling up the hills surrounding the Norwegian capital like an amphitheatre. This abundance of water and the flourishing vegetation find few equals in any other big European city. Once again, Oslo was fresh. Oslo is wide in terms of extension, but half of its surface is covered in parks and natural areas. Nature makes its way through the city itself, with the Akerselva river running from north to south and bringing more green and blue tones throughout its fabric. Oslo is not a metropolis; yet its population is witnessing an unprecedented increase – studies and statistics state that is one of the fastest, if not the fastest, developing city in Europe. 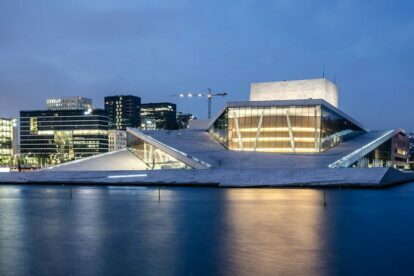 Oslo’s young and multicultural population is gradually transforming what was once regarded as a small, often uninteresting, capital into one of the most exciting centres not only of the North, but of Europe as a whole, with the perks but not the flaws of its larger sisters. What is it that you’re breathing? It’s more than the reinvigorating sea breeze – it’s an air of freshness and change. 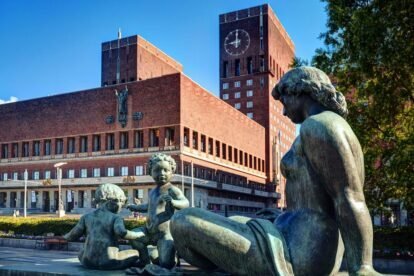 How to get the most out of Oslo? By checking out our 48 hour itinerary. As a local, of course. The Gamle Oslo district (English for Old Oslo) is the original core of the Norwegian capital: it’s where the city was first founded and thrived until the 17th century. The area is the location of some of the most notorious of Oslo’s attractions (i.e. the Edvard Munch Museum) and, aside from that, of an increasing number of tasty Spotted by Locals’ hangouts. In the multicultural and upcoming Grønland neighbourhood, sit outside Evita for your morning dose of caffeine; accompany it with any of their tasty food choices, but keep in mind that their excellent carrot and chocolate cakes are their big hits. Otherwise try one of the best branches of the Norwegian coffee chain Stockfleths in nearby Gamlebyen. Yes, it’s a chain, and it’s also living proof that a chain can serve much better coffee than some independent businesses in the same field. Oslo local Lene is a huge fan of their drip coffee, which she considers well worth the 10-minute wait. The place also features some persuasively good baked goods and a fantastic apple juice. From there, the city centre is no more than a 15 minute walk. Downtown Oslo is not only where the city’s main landmarks are located: in fact, it thrives both during the day and the night, hosting a variety of shops, restaurants, bars and clubs. Overlooking the sea, Arkeshus Festning is one of the oldest structures in town. 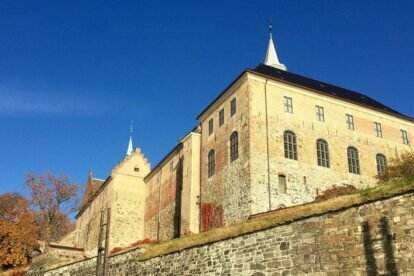 Back in the day this fortified castle was built to protect Oslo and was then subsequently used as a prison; nowadays, it hosts small museums and exhibitions. We don’t need to be foodies to know that Norway’s seafood is quite well appraised all around the globe. Also, Norway (and above all Oslo) has a reputation for being among the most, if not the most, expensive places in the world. The combo seafood/uber expensiveness might understandably scare you off… so, here’s a handy suggestion; in the city centre, Fiskeriet is both a market and an eatery serving quick, yummy sea-bites – fish ‘n chips and bacalao are ideal choices, but it is mandatory to check their amazing daily specials. Further tip: as the price sensibly differs between eating in/takeaway, take your food to go and enjoy it under the shining sun. Alternatively, the oldest building in the Kvadraturen (the original core of Christiania, known as ‘the Quadrature’ for its rectangular street pattern) houses Celsius Mat & Vinhus, a favourite of our Spotter Glenn. The sophisticated restaurant offers a selected amount of top-notch dishes for dinner, while lunches are more ‘casual’ though equally fine, featuring salads, sandwiches and mussles steamed in white wine. Once you’re there, Aker Brygge is at an easy walking distance. As part of the Fjord City urban renewal project, this neighbourhood along the western arm of Oslo Fjord has become a popular entertainment area among tourists and citizens alike. Relax on the promenade as you watch the street artists performing, or pay a visit to the Astrup Fearnley Museum of Modern Art, designed by star-architect Renzo Piano. However, unless the weather is nasty I would not recommend to spend much of your time indoors: from Pier n.3 in Aker Bryugge take a ferry and set foot on Bygdøy, a peninsula in West Oslo. 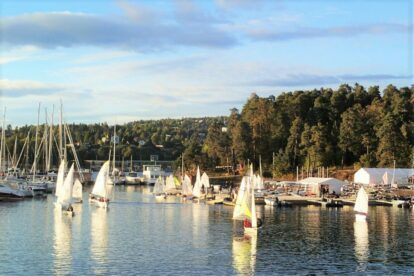 Aside from being home to a number of interesting museums (among them, the Kon-Tiki Museum and the Viking Ship Museum), Bygdøy is a natural paradise blessed with beautiful beaches and paths overlooking the sea. In the north-west side, in 2007 the beach known as Bygdøy Sjøbad, underwent extensive rehabilitation, and its pretty wind-sheltered cove is mainly frequented by families. 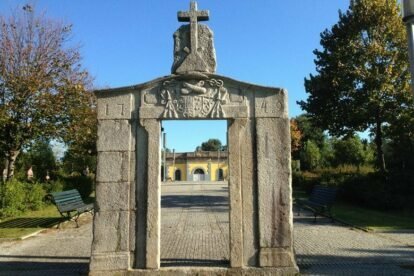 In the peninsula’s south end Hukodden (familiarly called ‘Huk’) is an additional beloved summer spot. For the records, a section of Huk is reserved for nudists. Otherwise, for those who enjoy fresh rather than salt water, get on subway line n.3 and get off at Ulsrud; from there, head to Ulsrud Lake. Roast under the sun, splash around, pick berries as you wander in the surrounding woods, join a barbecue… Ulsrud Lake is the ideal place to get in touch with nature – and it’s a really quick ride from the heart of Oslo. Why is Kafe Asylet such an awesome place for an evening out? First of all, its spacious, green and airy courtyard plays quite a big part: it’s the right place for sipping a cold beer surrounded by friendly people and positive vibes. Secondly, the food, of course – it’s dinner time, and the topic can’t be skipped; Kafe Asylet’s menu has a good choice of Norwegian traditional dishes – a perk that you should not take for granted in Oslo. However, if you’re seeking a high ‘sensorial’ experience to flabbergast your discerning palate, further to east, in the Kampen neighbourhood is the eponymous Kampen Bistro. In this restaurant nothing has been left to chance: the decor is sophisticated, yet unpretentious and intimate. The food is refined, the result of skilled chefs mixing aromas and flavours in the best way. The cherry on top: their excellent wine list. Sure enough, the price is above average, but not extreme considering the offer and that’s it in Oslo. Back in the centre, as you carry on with your night, check out Kulturhuset. The huge, polyfunctional space offers an equally vast variety of beers and wines. Open till early in the morning, the ‘House of Culture’ is good fun anytime during the day and hosts a range of events, from debates to gigs. Given its dimensions (you might find our Spotter Andrea getting lost while wandering around) and the number of inputs it provides, you could easily spend all your time there… or why not give Torggata Botaniske a try? 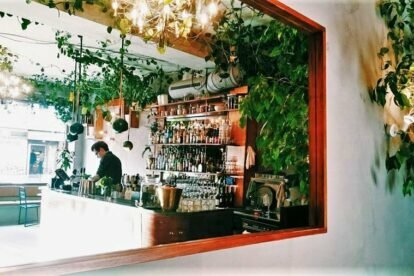 The bar is a not-to-miss for cocktail lovers: their menu changes with the season, and the bartenders always put in a dose of improvisation as they mix the fresh ingredients. Aside from the cocktails, the other protagonists are the plants, making Torrgata Botaniske a tropical garden throughout the year. A food spot serving tacos, functioning as a bar, and a basement for gigs; it’s Revolver. This indie kids hangout is just a couple of streets away from Torggata Botaniske. Packed, sweaty, loud music, a bit of a meat market before shutting down… each city has a list of places that match such a description. Oslo is no exception, Revolver is no exception: and that’s why good times are guaranteed. In case you are up for a walk, or a taxi ride, keep it cool at Lekter’n. 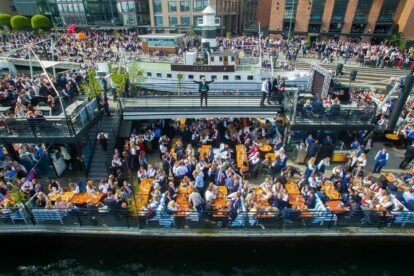 Located in Aker Brygge on a converted barge, here is where you can get the most out of the long northern summer nights. Lekter’n is undeniably a well-known spot in town: it’s pricey – like anywhere else in Aker Brygge – and rather touristy. But the view over the fjord and the fortress, as well as the funky music lineup, featuring up-and-coming DJs, make up for it. Oslo has been historically divided between West and East. While the western districts of Oslo, such as Frogner, is where the rich and wealthy established their residence, the East End is traditionally known for being home to the city’s working class. A proper watershed clearly marks the difference between the two portions, also in geographical terms: it’s the Akerselva, with most of the Grünerløkka district located on its eastern banks. 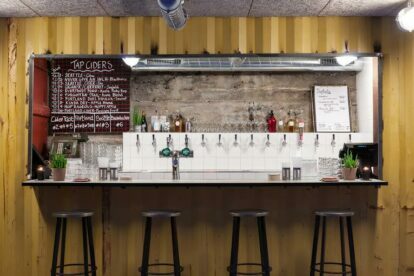 Once a true working class district, in the last twenty years Grünerløkka has turned into the trendy bohemian hot-spot of Oslo – and it’s exactly here where your second day is starting. Grunerløkka Bakeri’s light wooden interior welcomes you with a strong, delicious scent of roasted coffee and baked bread. But it’s not just about coffee: their sandwiches are among the best in town, while their bolle (a traditional sweet, flavoured bun) are divine. 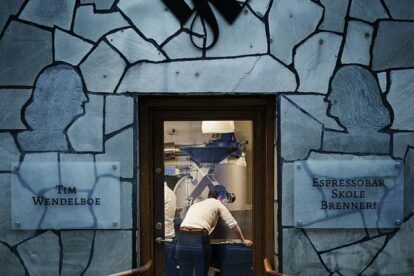 Alternatively, the little Tim Wendelboe is arguably the number one place in Oslo for coffee – the queue that stretches out the shop’s doors says it all. 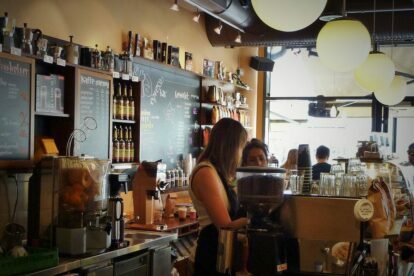 They roast the coffee themselves, and you can also buy their beans – and just in case you don’t have a grinder at home, the baristas will be happy to do it for you! 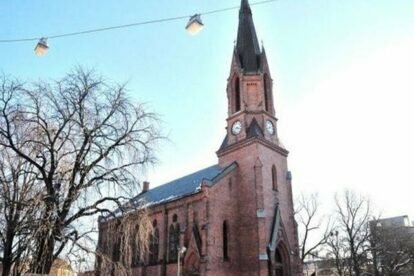 On the western bank of the river, where Grünerløkka ‘meets’ the Gambleyen district, the Kulturkirken Jakob is a brilliant example of conversion. Since 2000 the once-church has been turned into a fascinating venue for concerts, events… you name it. Check their rich programme, something interesting is probably going on under its Neo-Gothic vaults. Hungry? Thirsty? 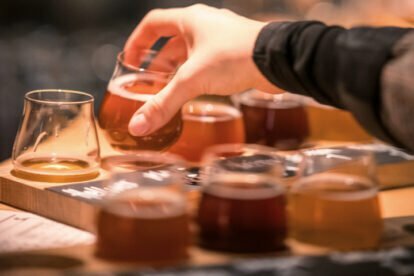 Crow Bryggeri is around the corner; along with their own house beers and a vast choice of other niche brews. Crow Bryggeri’s upstairs offers some tasty rotisserie-cooked pork meat-based dishes and onion rings in a concrete-and-steel industrial setting. 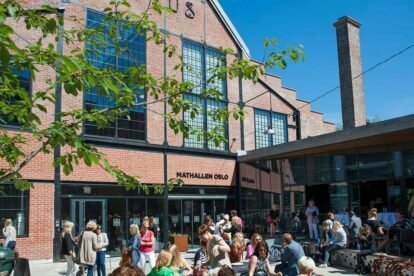 The place is buzzing during the night too, so if you’re planning to pay a visit later head north for a gourmet – and yes, not exactly cheap – experience at Mathallen, the only covered market in Oslo. It didn’t take long before Mathallen, after opening a few years ago, became a major hit in the scene. The hype is now kind of gone, but it remains a great place for a quick and top-quality lunch break. South of Mathallen, meander down Damstrede, one of Emily‘s most beloved streets in town. The painted houses and peaceful atmosphere of this village-like, cobbled street leading to the Akerselva river, are a unique sight in Olso. Nearby, the tune changes at Ingens Gate (in English, ‘Nobody’s street’); it is even more colourful than Damstredet, but in this case it’s due to the graffiti that covers every inch of the walls. If you have the chance to be there on Sunday, between 12:00 and 17:00 a pretty arts-and-crafts market takes place outside and inside Blå, a well-renowned concert venue. For sale are a variety of items, ranging from vintage clothes and toys to jewelry and paintings. Always on Sundays (with a few exceptions) is another market – this one mainly featuring antique and second-hand goods; it takes place in Birkelunden, a lively park further north in Grünerløkka. How do you feel tonight, and which kind of dinner experience are you after? I’ve got a couple of suggestions which are pretty much at odds with one another. With vaulted ceilings, candle light and discrete Gregorian music in the background, Klosteret (the ‘Monastery’) makes for the perfect place for a lovely, tranquil rendez-vous with your special one. 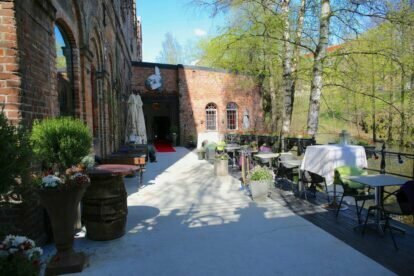 The food is a well-achieved mix of Norwegian and international specialities with an interesting wine list though the prices are a bit expensive… but hey, the cellar itself was awarded “Best of Award of Excellence” five years in a row. Too dark? In Grønland Dattera til Hagen (‘Daughter of the Garden’) hides its new age-ish quirkiness behind an unassuming facade. But go past the arched walkaway into the backyard, and you’ll be dazzled by the psychedelic colours of the furniture and the artwork on its walls. Food is easy and good, but as you might guess correctly, it’s all about the atmosphere. On top of that, Dattera til Hagen’s nights are brightened by an eclectic range of events, from DJ nights to stand-up comedy. For chilled beers and drinks, stroll along the Akersleva river and join the crowd at Café Månefisken. Housed in an old factory, Café Månefisken overlooks one of Elin‘s spots: Møllefossen, the tiny yet vigorous waterfall of Oslo. It’s a typical summer hangout – from September until April the venue is only open for events – so don’t waste the occasion to take advantage its outdoor area and music events on a daily basis. The brainchild of the same folks behind Crow Brygge, Himkok keeps surprising its customers by constantly renovating themselves – no surprise that they manage to keep up the hype! Cocktails? They have them. 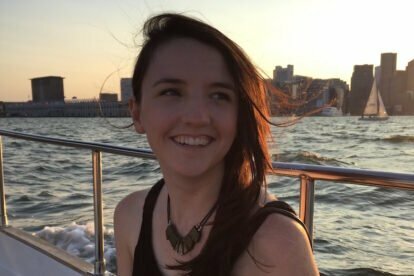 What about ciders? There’s a cider bar too. To complete the picture, live music events and merry people. Otherwise, on one of Grünerløkka’s liveliest streets is Parkteatret; a vintage theatre. Parkteatret is a funky venue for live concerts and music events. Weekends is when it gets raucous, and during summer nights people take their drinks and flock outdoors, filling the tables there. For more always up-to-date tips by our Oslo locals check our Oslo Blog or download our 100% offline Oslo app.